Just like any self-respecting 22 year old adult, I'm a huge fan of Disney... judge away but I love Disney and especially Disneyland. What's not to love when you combine a land of childhood characters, roller-coasters and magic… Okay, so Disney may not sound like everyone's cup of tea but I once had an aim to visit every Disneyland in the world, maybe not so much now as I've discovered life beyond the Magic Kingdom, but here goes the blog anyway. Also in 2016 a sixth resort will open in Shanghai. So, there are five resorts and you need a trip around the world to cover them all. So far I have visited Disney in Florida, Paris and Tokyo and all have appeared fairly different. In all of the parks the actual Disney Park (or 'Magic Kingdom') usually remains fairly similar, with the same rides and the same kinds of 'lands'. 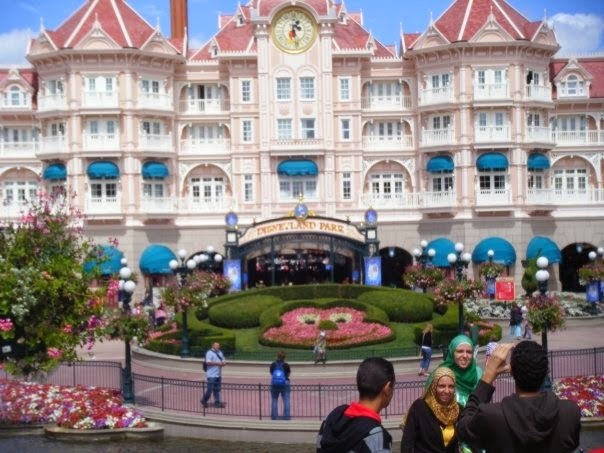 However, each park has expanded upon the original Disney Park, making each location individual and unique. The California Resort is quite iconic as it was the first Disneyland, and actually built and managed by Walt Disney himself back in 1955. Because of its age I assume some of the rides can be a bit slow and maybe even outdated. However, as California is so big, they have added to the original park with Disneyland California Adventure which acts as a new park and add-on to the original. The park focuses on different locations in California, for example a Hollywood section, a section based on the pier and a condor section which pays tribute to California workers. I'd say this park is worth a visit just for its iconic status, but both parks can't easily be done in a day. The name speaks for it all with this resort. Florida has taken over the Disney Empire in terms of resorts, as there isn't just one park. The Disney Empire in Florida has four parks and three water parks, making Florida the biggest Disney resort in the world. I went to Disney in Florida when I was 7 years old with my family. Unless you have about two weeks to kill and the willingness to spend a lot of money, then maybe the Florida resort isn't ideal. Each park is very individual and worth a visit. For example Epcot looks at different cultures from around the world and even explores a bit of science, whereas Animal Kingdom is basically a huge zoo with a hell of a lot of rides. Worth going to, but may break the bank. My most recent Disney adventure. Tokyo Disney Resort is actually the most visited place in Japan by tourists, which is kind of a sad statistic in my eyes because Japan has so much more to offer. Tokyo Disney Resort has a second, adjacent park called Disney Sea, which is the resort I went to when I visited. As the name suggests it is a park based on water and the sea, but not actual water rides. It features lands such as Atlantis and New York Harbour but also features your more traditional Disney park rides such as Indiana Jones and the Tower of Terror. I had an awesome time when I went, but twelve hours later and I still didn't get on all of the rides I wanted. Really plan when to visit this park as Tokyo is packed at the quietest of times. I've visited this resort a fair few times as Paris is not exactly far from my home. My first trip was when I was about 6 years old and my most recent trip was when I was 17. Honestly, I think I had the best time when I was 17. The Paris resort has two parks which can both be covered in a day if it is fairly quiet. Your ticket grants you access to both parks at a little extra cost, but it's worth it! The rides here were much faster and bigger than those in Florida and Tokyo so this park is more suited for adults who want to experience the thrill factor. Most things are in French and English, such as the parades, so you can understand what’s going on. My friend spent a year in Hong Kong and never went to this resort. I was in Hong Kong for four days and angry that nobody wanted to go with me. Although I have heard that this certain park is small and not particularly great. Having never been I can't judge too harshly, but from doing a bit of research it only has the one park, which already makes it much smaller than any of the other Disney resorts. The resort mimics the California one, in terms of the different sections and all of the rides, so maybe it's not on the top of your list of things to do whilst in Hong Kong, and I wouldn't blame you if it wasn't. Even if you aren't a big Disney fan then these parks are still worth going to. The rides are incredible, and you can get some thrills for definite. Also the Disney theme parks are some of the cleanest and most organised parks you will ever see, all of which was part of Walt Disney's philosophy. Maybe I'm a little too obsessed about this, but once I visit them all then maybe I'll shut up.